Unmanned aircraft, commonly known as drones, are taking over the world. At least it seems that way. If you don’t believe me, search for “drone” on YouTube. You’ll find amateur aviation specialists — and a variety of professionals — demonstrating what drones can do. Some of the things are pretty amusing. Chris was using the drone to get images of changing leaves in Magazine Beach Park in Cambridge, Mass., last Wednesday, when he saw a bird circling a good distance away. The circling continued as the bird moved closer to the drone. 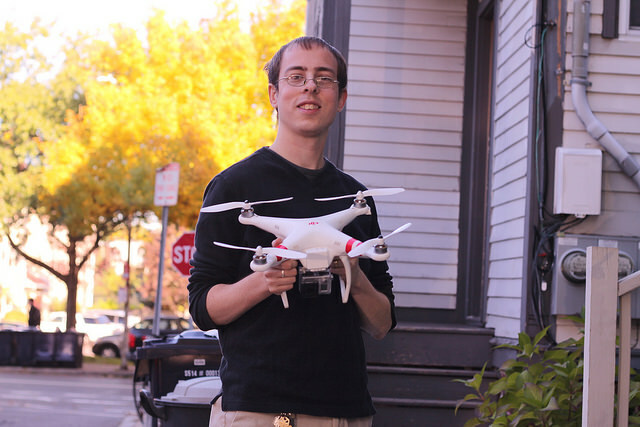 Christopher Schmidt with his Phantom drone. Photo courtesy of Christopher Schmidt. He said he saw no evidence beforehand that the bird was upset or likely to attack. Over the six months he owned the drone, nothing like that had happened, except for a few crows squawking at the aircraft. After he posted the video, he learned from bird experts that immature red tail hawks have not yet learned to hunt efficiently, so they may attack anything that moves. As the hawk attacked, Chris cut power to the props, which caused the quad to drop. The bird hit the chopper and it flipped. Chris was unable to recover the flight, still worried about the bird, though he powered back up at the end. about a half second, so I was not really thinking that much through it. 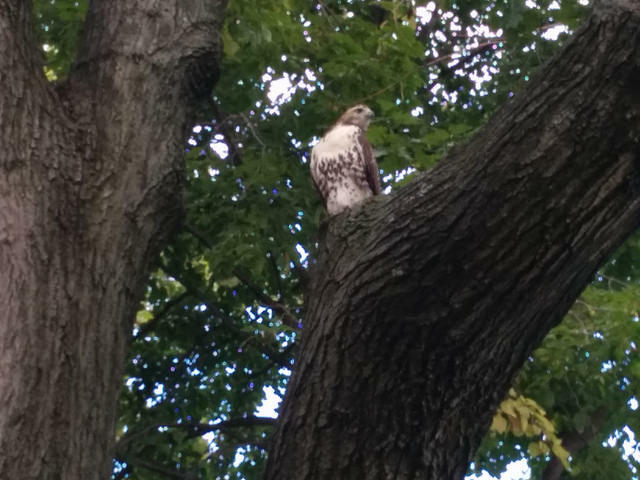 The hawk appeared to be fine after the attack. As it turns out, the quad sustained almost no damage from falling out of the sky and hitting the ground, except for a slightly bent landing gear. And the hawk was no worse for wear. Lots of media have been using the footage that Chris took. Based on a suggestion from a coworker, he is donating any money raised from YouTube ads to the American Audubon Society. Thanks to Gene Bullock of Kitsap Audobon for alerting me to this video. OK, so what are some other odd things that drones can do? How about helping out with an ALS ice bucket challenge? In the second video, Austin Hill of Spark Aerial uses a massive DJI S1000 Octocopter to lift a bucket of ice water and pour it rather slowly on his head. I’ve shown you videos of the Flyboard®, an apparatus developed in France by Franky Zapata. See Amusing Monday, Oct. 15, 2012. Martin Schumacher goes one better by using a DJI Phantom and GoPro Hero 3 to shoot an up-close demonstration video around Saint-Tropez in Southeast France. It was only a matter of time before someone got the idea to use a drone for fishing — no matter how inefficient that might be. Check out this 7-minute video by NightFlyer (the action starts about 5 minutes in) or this shorter 1.5-minute video by RYOT. Both these guys now have fish stories to tell. But, after all that work, even they would admit that the fish they caught are rather amusing. On a more serious note, there are many legal issues related to drones, which are not yet approved by the Federal Aviation Administration for commercial use, and there are many concerns related to privacy. People also are raising questions about whether drones should ever be used for hunting or fishing. Michael R. Shea tackles the subject for “Field and Stream” magazine. If sportsmen are thinking about using drones, game wardens are not far behind, as they consider how drones might be used to catch poachers. “National Geographic” looks at the use of drones in high-seas fisheries enforcement. Meanwhile, Gov. Jay Inslee of Washington vetoed a bill that would have limited the use of drones by law enforcement. He then set up a task force to look at the entire subject. 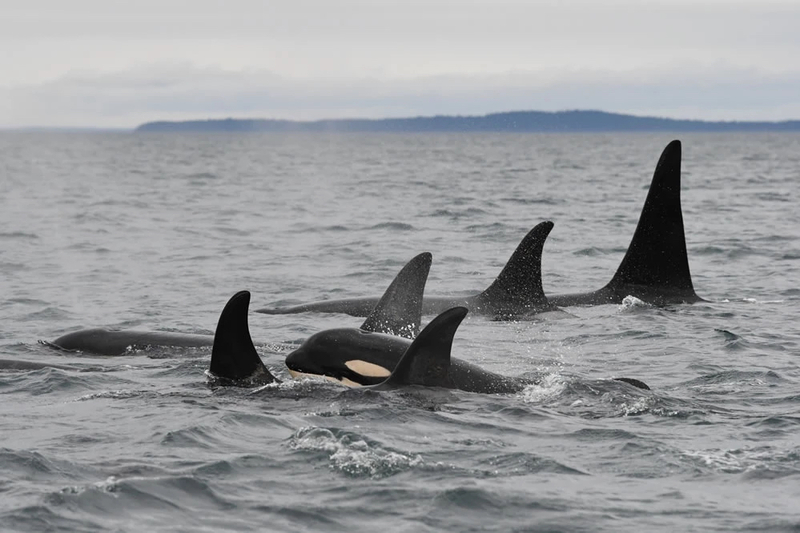 A representative of Washington Department of Fish and Wildlife said in one task force meeting that there could be applications for enforcement and research by the agency. The Unmanned Aircraft Systems Task Force is expected to make recommendations before next year’s legislative session.